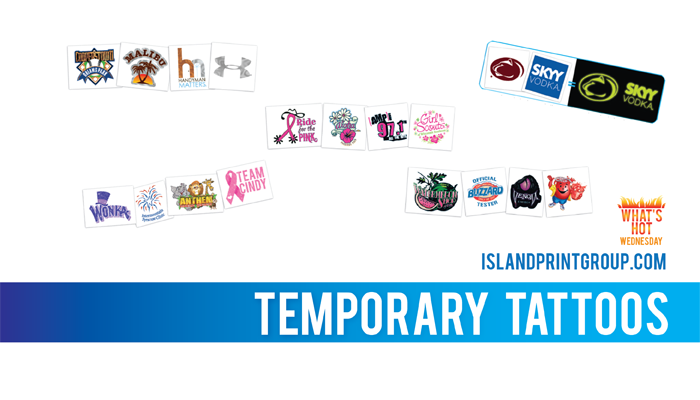 What’s Hot Wednesday: Temporary Tattoos! Temporary tattoos have made so many advances in the last few years. Not only can you get your regular temporary tattoos that we all know and love, but you can get GLITTER, GLOW IN THE DARK, METALLIX, NEON and brand new: SCENTED! A layer of transparent glitter is laid over your full colour design. Absorb light and illuminate in the dark for hours! Add some shimmer to your design! Available in Bronze and Silver. An intense pop of colour that lasts for days! Ask us for available colours. Yep, you read that right. SCENTED! Currently available in Chocolate or Berry scent. There are some pretty cool ideas for temporary tattoos. One of my favorite ideas is for a running event. Have the map of the course as a temporary tattoo so the participants can have the map on their arms! Are you promoting at a healthcare event? What about the image of a bandaid with your logo on it? Another great idea is using temporary tattoos for event entry instead of stamps or wristbands! Not only do they look really cool, they’re non-transferable and waterproof! Of course they’re great for causes and awareness, and don’t forget that you can add some pizzazz with glitter, neon colours or glow-in-the-dark!